This is one of those dishes that absolutely melts in your mouth. Baked to perfection, you can’t go wrong with this perfect recipe! 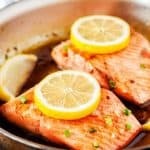 This honey glazed salmon recipe is so easy and comes together so quickly, it’s sure to be an instant favorite in your house! Now about that 6- minute baking time: It is recommended that for every half-inch of salmon you should roast/bake it 4-6 minutes. Baking for 4 minutes will give you salmon that is still a touch rare and at 6 minutes it should be cooked through. Still not sure if your salmon is done? You can check the doneness with a fork. The salmon is done when it flakes easily. The browned butter adds something magical to this recipe. It just takes a couple minutes to do and creates the most amazing subtle “nutty” flavor to the salmon. Browned butter sounds fancy and complicated but it is not. The process of browning butter includes slowly heating butter in a saucepan until it starts to bubble. You then whisk vigorously until the bubbles create a foam and eventually turn golden brown. Pro tip: once the butter turns golden brown, make sure to pull it from the heat. Burning happens relatively quickly once you get to that point. 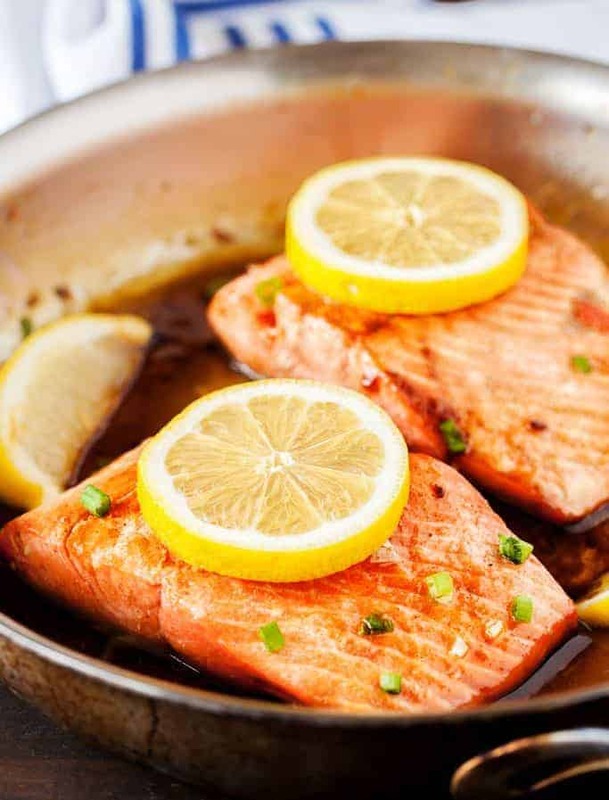 To make browned butter salmon, you will make the browned butter and then add in the honey lemon and garlic. You will reserve half at this point because you will need it later. Add in your salmon filets and sizzle for 6 whopping minutes. That’s it! Serve it up with a little extra sauce! Love Browned Butter? 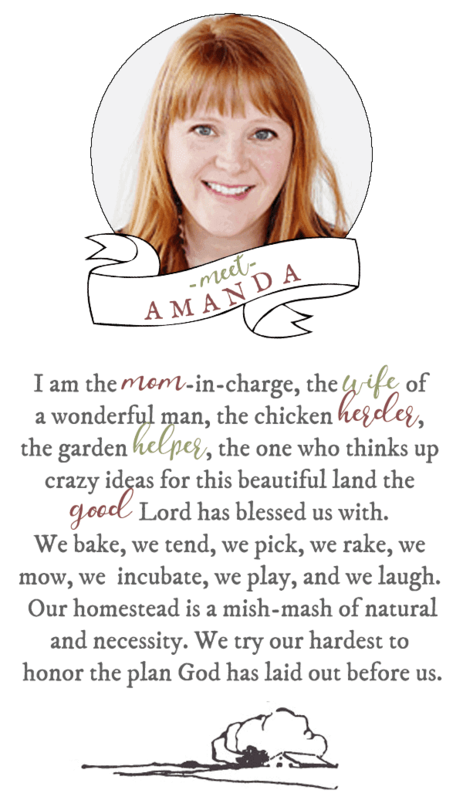 Here are a few other recipes! You should definitely check out these browned butter recipes! 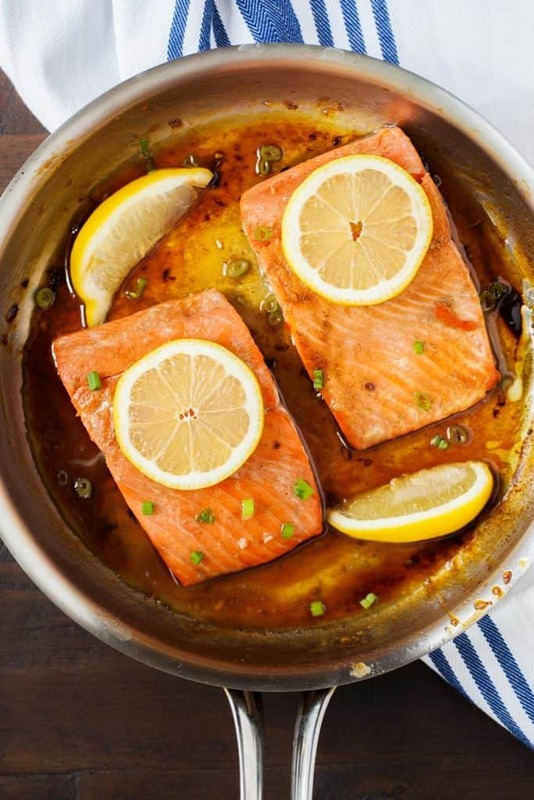 Baked Brown Butter Honey Glazed Salmon is a delicious sweet and sour dinner that’s ready in 15 minutes! The simple ingredients make this dish a no-fuss meal that will be enjoyed by everyone. In an oven-proof skillet, melt the butter over medium heat. Once the butter foams, swirl until the foam dissipates. Continue swirling until golden-brown bits form at the bottom. Lower the heat to medium-low and stir in the honey, lemon juice, and garlic. Pour half of the sauce into a small bowl and set aside. Serve the salmon warm with the reserved sauce and garnish with lemon wedges. Did you Make Honey Glazed Salmon? Wow, you do not know what you’re missing. Once you’ve had salmon, you are ALWAYS going to want salmon! Cynthia Warner: I agree about salmon!! I could never find a fish I liked and went to Kroger and got a couple slabs with there seasoning on it in a baking bag and it was soooooo good. I’m going to try this recipe later it looks really good too. We also went deep sea fishing and I caught a 75 Yahoo, when we got back to shore they asked me if I wanted to sell it or keep it and I kept it!! The Captain of our boat cut it up for me. What is strange is the only tuna I like is in the can and I thought I would like it regardless!! By the way this was in Georgia, off the coast of Savanna and our captain took us out 72 miles it was so awesome!! Oh! My goodness sooooooo yummy???????? Can I bake it in the microwave? Thanks. Delicious…my family loved!! Thanks for sharing???? Are you supposed to take the skin off the bottom? I don’the remove the skin before baking. Thought I read, “BAKED BROWN BUTTER HONEY SALMON”, didn’t see brown sugar added in ingredients. Brown Butter is a technique for cooking the butter. It doesn’t have anything to do with brown sugar. Do I really need to have it with honey? Does it need to b covered or uncovered to cook it? Best salmon I’ve ever had but….six minutes was not long enough (I cooked two pieces). 14 minutes was perfect. this recipe is confusing, is the salmon done on the stovetop, as the video shows, or in an oven. ?? I was wondering the same thing. It says to fry in brown butter for 6 minutes. But the article says preheat oven to 400? STOVE TOP OR OVEN? I was just reading about fermented garlic cloves in raw honey. Also how to ferment sliced lemons. This recipe would be awesome using the fermented garlic and honey, plus a couple slices of fermented lemon.